You may remember my last post showed a new anticipated Baking magazine Baked and Delicious, which was just about to hit British shelves, well I was fortunate enough to be sent a copy of the Magazine by its publishers so I could review it for all my readers. 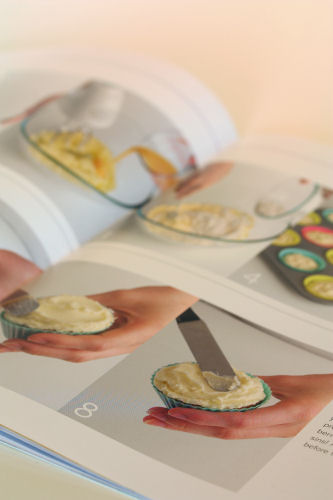 The Magazine promised to offer “Sweet and Savoury, traditional and modern recipes gorgeously illustrated and full if tips for better baking.” and I must say I was not disappointed. It came with 7-9 recipes for so many different baked goods, including Focaccia, Dundee Cake, Choux Pastry and my all time fave Vanilla Cupcakes. At first I was unsure if this was enough recipes but then I thought about the fact that its a fortnightly not monthly publication and decided its probably just the right amount. It provides a variety of recipes most of which you could try most nights of the week and to be honest just enough for a fortnight of free time. (which most of us don’t have now a days). I found the step by step instructions (which come in photo and written description) very helpful and easy to follow, they were clear and if a novice baker you would be able to follow them easily. At this point my only real complaint (and its not much of one) is I wish they did the step by step for every recipe not just a selected few. I felt it only fair that to review the magazine I should defiantly have tried making something. As time was short for me this week I picked the Vanilla Cupcakes a true favourite and thought lets see how this recipe measures up to the many I have used. I chose to only make 1/2 a dozen and was pleased when I got to use the free silicon cupcake cases that come with the magazine. I must say I was very pleased with the result, as I stated before the instructions where beautifully easy to follow and the cakes themselves came out delicious ( my hubby added some of the best I have made) the butter cream icing for my personal taste was a little runny but all in all a very tasty recipe. So shall I be subscribing to the magazine ? I think I honestly shall, I know I shouldn’t as I have very little space to store it but it does come with a free gift binder in one of the issues along with a whole host of silicone bake ware and cake tins etc and who can say no to such great gifts. So go check out the magazine and I would love to hear your views.